We’d love your help. Let us know what’s wrong with this preview of The Field by Baptiste Paul. “Vini! Come! The field calls!” cries a girl as she and her younger brother rouse their community—family, friends, and the local fruit vendor—for a pickup soccer (futbol) game. Boys and girls, young and old, players and spectators come running—bearing balls, shoes, goals, and a love of the sport. “Friends versus friends” teams are formed, the field is cleared of cows, and “Vini! Come! The field calls!” cries a girl as she and her younger brother rouse their community—family, friends, and the local fruit vendor—for a pickup soccer (futbol) game. Boys and girls, young and old, players and spectators come running—bearing balls, shoes, goals, and a love of the sport. To ask other readers questions about The Field, please sign up. Here’s an interesting conundrum for you. Rattle it about in your brain for a while. It is an uncontestable fact that the majority of picture books published in America in a given year feature either white kids or animals. Now this is just talking about the bulk of the publishing industry, and there are always exceptions. So while the big publishers take baby steps in the right direction, it’s the small presses that go for the gold, bringing us books we’ve never seen or, even better, never known Here’s an interesting conundrum for you. Rattle it about in your brain for a while. It is an uncontestable fact that the majority of picture books published in America in a given year feature either white kids or animals. Now this is just talking about the bulk of the publishing industry, and there are always exceptions. So while the big publishers take baby steps in the right direction, it’s the small presses that go for the gold, bringing us books we’ve never seen or, even better, never known we should miss. Years ago in New York I remember receiving a request to pull together a collection of picture books set in the Caribbean. It took a lot of searching, and probably the inclusion of more than one out-of-print title, but eventually my colleagues and I were able to pull something together that we were proud of. That was about ten years ago, and I’d love to tell you that if someone were to ask me to name my top ten Caribbean children’s books off the top of my head, I’d be able to do it. I can’t though. We still see too few islander stories. It is worth noting, however, that once in a while you get a book that is not just an exception to the rule, filling a need, but is just a killer original title as well. I’ve never been to Saint Lucia, and maybe I never will, but when I read The Field by Baptiste Paul and Jacqueline Alcántara I at least catch the barest whiff of the place in as eclectic, exciting, and downright fun a format as possible. In the beginning there is just one boy, already in his soccer uniform, kicking a ball through the trees. When his brother joins him they set about putting together a team from the kids in their village. The local fruit seller agrees to play the role of ref and the next thing you know the cows have been shooed off the field and there are eight kids on the muddy grass, shooting, passing, running, and diving. “This way!” “Isi!” “Pass!” author Baptiste Paul fills his book with Creole words and phrases. When rain threatens to end the fun the kids declare “No way” and keep on playing. Rain won’t stop them. Wet dirt won’t stop them. Only after the mamas call and everyone has to go in for the night does the excitement finally stop . . until everyone sleeps and dreams of games to come. This book is important to me, and in multiple ways. It’s not just that it provides a glimpse into island life that a lot of kids in the U.S. would certainly never see otherwise. It’s also a sports book. As kooky as it sounds, we don’t really see a lot of sport-related picture books in a given year. Because 2018 was a World Cup year we did see a teeny tiny uptick in soccer titles. Books like Kick It, Mo by David Adler and Sam Ricks, for example, were a tiny drop in a bottomless need. I don’t know why sports books don’t get more love, what with their built in drama and storytelling potential, but it’s all the more reason to jump up and sing when a book like The Field comes along. And as strange as it sounds, when I realized that this was that rare sports book, I began to pay closer attention to the degree to which the artist working on the story was able to bring that sport to life. While reading this book I had a real sense of how adeptly Alcántara is able to convey movement. From the endpapers onward this book is riding on its ability to make its players move. It got me to thinking. When we talk about the art and skill of one illustrator or another, do we ever talk about how skilled they are at making their characters move? Out of curiosity I decided to take a peek at the Caldecott Honor and Award winners (for the most distinguished picture books published in a given year). When was the last time a book won where characters were moving, preferably in some kind of a sport? Well, if you count dance then there was R. Gregory Christie’s work on 2017’s Freedom in Congo Square. Journey by Aaron Becker had a lot of falling, running, flying, and boating in 2014. But for a straight sport you actually have to go back as far as Christopher Bing’s 2001 Honor winning work on Casey at the Bat. Now the lack of sports books on the award listings has as much to do with the fact that they’re hardly ever published as anything. Even so, I think it’s high time we gave some proper credit to artists that know how to convey speed, movement, and the inherent drama of the field. Alcántara’s work makes for a particularly nice complement to Paul’s text. It isn’t just how well she can make a soccer game understandable on the page (something not easy to do in real life, let alone in fiction). Look at how she brings liquid and mud and rain into this magnificent spattered, splattered, mess. The drops of paint on the page never obfuscate, even as they compete with the non-splattered images for dominance. There will be those for whom Alcántara’s rough characterizations don’t appeal, but if you stop and look at what she’s doing it’s impressive. Every single character playing soccer is an individual. Did you notice the girl that plays half the game in blue rain boots? Can you make out the teams (and did you notice that the twins are on opposite sides)? And look at the light. How the sky melts from blue to gray, ominous and foreboding. Or how the field is lit at night, when the mamas call in their filthy mud-splattered kids. My favorite picture in the book is probably of the kids running back home as the sun sinks red into the horizon, lighting the whole world with that same pre-twilit umber glow. Bilingual children’s books are a pickle. If you want to convey the tenor and tone of a place, it makes sense to include text in the native language. But how precisely do you do that? I’ll be blunt with you. If you do a straight up bilingual translation of the English text, that fills a very precise need of a segment of the buying public. Over the years I’ve come around to books that integrate two languages together. Mr. Paul does a lot of that here. Sure he includes a glossary of Creole words and phrases (complete with pronunciations) at the back of the book for easy translation, but it’s almost unnecessary when you consider how often he includes them with their English equivalents in the story. Take, for example, when one kid slips in the mud. “Ou byen? You okay? Mwen byen. I’m good.” In his Author’s Note, Paul notes that Creole is mostly a spoken rather than written language, and that it is put together from a range of different languages, including French, English, Hindi and others. I should note that there has been a push in recent years to no longer italicize words in a language other than English in a book’s text. This book does italicize, but it’s a subtle difference and not one I think I would have noticed if I hadn’t gone looking for it. Let’s talk titles now. They say not to judge a book by its cover. They may as well say not to judge a book by its title. And in the case of this particular book I’d implore you to follow that advice. The Field sounds like a serious work of adult fiction by a dead white author, does it not? There is gravitas to it. Seriousness. This is probably why one of my fellow children’s librarians started to refer to this book by an entirely new and made up name. And let me tell you, once he started calling this book “Futbol Mud Match” I could never really go back to that dry and distant title The Field. Look me in the eye and tell me that “Futbol Mud Match” wouldn’t be a better, more exciting, and downright perfect name for this book. It would integrate the Creole of the text with the promise of muddy, sporty fun. Many times an author doesn’t have final say on the title of their book, but if this was the dream title Mr. Paul always wanted then so be it. It’ll always be “Futbol Mud Match” to me. Do you have to love soccer to love this book? Not hardly. As I mentioned before, sports are perfect children’s book companions because each game is rife with excitement, drama, and potential humiliation. All the best ingredients for a rousing tale! You could just as well ask if you have to love rain to love this book, or the Caribbean, or cows. The only thing you have to bring to this story is a love of good books, and a capacity to be wowed when a debut team pulls out a book as cool as this. A story so good you’ll be half tempted to pull your own soccer ball out of the shed and take it to the nearest muddy park for a spin. A true original. This wonderful children's story delves into the simple pleasure of playing sports with rare use of creole combined with vibrant images of children of colour enjoying a day outside with each other. Soccer. The Beautiful game. One thing that brings cultures together is the love of this game. I have lived in many cities and I have been able to create beautiful moments on the field with people from across the globe through a shared language of soccer. Baptiste Paul grew up in St. Lucia, a small and beautiful island in the Caribbean and this book is both an ode to soccer as it is to the French Patois he grew up speaking. Great little book. Find The Field at the Westminster Public Library! The first picture book I've seen to depict good sportsman/womanship so deftly. Absolutely stunning artwork, and I loved the mixture of English and Creole as well as the author's note about this mixed language inclusion. Also, he says, "I love the concept of play: everyone cheering together, forgetting about whatever challenges live can bring." Well said, Mr. Paul! This is a lovely book based on the author's memories of his own childhood. It has some lovely bright images that really help illustrate the story and these in turn help show the reader how things don't always go to plan but with a few small changes you can still succeed. I loved the use of Creole which is added every few pages to bring the story back to its origins in St Lucia. Effective peek into the daily lives of children from non-western countries. While this takes place in the Caribbean, the agenda would likely feel very familiar to children all over the world. Significant. Love the play between the text and illustrations. And learning Creole is rad! Love the graphic novel panels too. Really awesome book. Lush illustrations highlight the simple, exuberant story of an afternoon soccer match. I like this book! I don't find many books from the Caribbean that include some Creole words and phrases! Any child who enjoys soccer (fotbol)will love this book! The illustrations by Jacqueline Alcantara are wonderful and alive! They have such a joy about them! Young kids will enjoy this story. The illustrations are fantastic! Joyous energy creates a beautiful book full of spirit with a loving sense of home and community. The prose didn't quite flow for me, but I appreciated the Creole interwoven in the story and the author's note that gives the Caribbean setting a place to shine. A definite add to any classroom or school library. A great story of friendship and youthful spirit, this is the perfect book to read with your little soccer fan. It also includes words in Creole, making it a dual learning opportunity. Told in both Creole and English, this picture book tells the story of a group of children who want to play soccer together, but they have all sorts of obstacles to overcome. They have to move the cows and goats out of the field and then start to play. Once the game really gets going, the rain starts. They quickly decide to keep right on playing even in the wet and the mud. At the end of the day, they go home dirty and happy. Set on the Caribbean island of Saint Lucia, the book invites readers to Told in both Creole and English, this picture book tells the story of a group of children who want to play soccer together, but they have all sorts of obstacles to overcome. They have to move the cows and goats out of the field and then start to play. Once the game really gets going, the rain starts. They quickly decide to keep right on playing even in the wet and the mud. At the end of the day, they go home dirty and happy. A young islander kicks a soccer ball around for a bit until he ends up near a field. He rounds up friends and family for a game. First they must drive the cows from the field and create a game space with goal posts. The game is on! Neither rain nor mothers calling them home can stop the youth or the referee once it has begun. They play and play until the mothers have had enough! Even in bed these young boys dream of football. The story is told mostly in English with bits of Creole vocabulary thro A young islander kicks a soccer ball around for a bit until he ends up near a field. He rounds up friends and family for a game. First they must drive the cows from the field and create a game space with goal posts. The game is on! Neither rain nor mothers calling them home can stop the youth or the referee once it has begun. They play and play until the mothers have had enough! Even in bed these young boys dream of football. A little girl soccer-dances her way through a forest, finally arriving at a field with cows and goats. She gathers everyone she can find for a game, after setting up the goals and shooing the animals off the playing field. It’s funny that it’s even a question as to whether the game would stop because of rain. Ask any kid and they’ll tell ya it’s more fun playing soccer in the mud. And like the professionals they get a long soothing bath once their dirty clothes are off. At the end there’s a two-pa A little girl soccer-dances her way through a forest, finally arriving at a field with cows and goats. She gathers everyone she can find for a game, after setting up the goals and shooing the animals off the playing field. At the end there’s a two-pager of every character playing with a ball, including the moms and the cows. This includes a little blonde girl, who is treated no differently by all the other inhabitants of what I assume to be a Caribbean island, from the Creole-looking version of French tossed in every once in a while (confirmed at the end, with a page of translations). 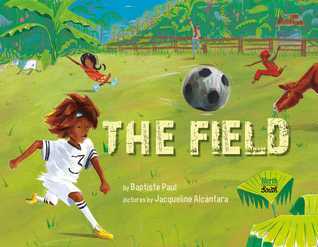 The Field by Baptiste Paul follows one Creole girl in her efforts to start a pick-up soccer game. The girl walks around the village with her younger brother eagerly gathering up their friends. They have to shoo the cows out of the field before they can play. The game escalates quickly. Feet become a blur. Suddenly, the sky opens up turning the field into a muddy mess. Will the girl's soccer game be ruined? I thought this was a fun read. Paul's incorporation of Creole words is educational as well a The Field by Baptiste Paul follows one Creole girl in her efforts to start a pick-up soccer game. The girl walks around the village with her younger brother eagerly gathering up their friends. They have to shoo the cows out of the field before they can play. I thought this was a fun read. Paul's incorporation of Creole words is educational as well as entertaining. The text is minimal, yet still impactful with a powerful lesson hidden within. Jacqueline Alcantra's illustrations are simply stunning. The scenes are vibrant and bursting with life. Children will be drawn to the eye-catching images. I especially love her use of a very dark background for the rain scenes. This really makes the rain pop on the page. For a satisfying virtual visit to the Caribbean, open the covers of THE FIELD. Author Baptiste Paul grew up in St. Lucia, speaking Creole and playing with his siblings and neighbors at every opportunity. The spontaneous, free-wheeling, all-out "living in the moment" captured in this simple circle story lands the reader smack-dab in the scene: rounding up playmates, shooing the side-eye-ing cattle, and empathizing with every step, slip, slush, and GOOOOOOAAAAL along the way to exhaustion. The imme For a satisfying virtual visit to the Caribbean, open the covers of THE FIELD. Some children meet in the field to play some futbol. They shoo off the cows and don't mind a little rain, and play until their moms call the game. This is a very worldwide experience. It would take a very long time to list all the countries in which kids will gather in whatever space they have to play in and kick a ball around as long as they can. The words are simple, mixing a little Creole and English. The field displayed may seem exotic to some North American and European kids, but much of the Some children meet in the field to play some futbol. They shoo off the cows and don't mind a little rain, and play until their moms call the game. A vibrant pickup game of soccer is set against a lush Caribbean backdrop. The young girl at the heart of the story brings a community together for soccer. They have a few obstacles to their came: cows in the field, a rainstorm overhead, Mams calling them home for the evening, but the kids in this story push the limits and stretch the fun! The text combines Creole words with English. The meanings are simple and easy to understand, and a glossary in the back helps with pronunciation. This story will A vibrant pickup game of soccer is set against a lush Caribbean backdrop. The young girl at the heart of the story brings a community together for soccer. They have a few obstacles to their came: cows in the field, a rainstorm overhead, Mams calling them home for the evening, but the kids in this story push the limits and stretch the fun! For Soccer fans, this is a great book. It shows children in a Creole speaking island playing soccer on a cow field that has been transformed into a soccer field by the addition of a bamboo "goal." It’s also a good book for fans of other countries and cultures, as they may be intrigued by the different language (a handful of Creole words appear in the book). The kids enjoyed it and voted to give it 5 stars. The Field's illustrations and story are equally beautiful allowing the reader to glimpse into a moment in life on a Caribbean island. Children play an intense game of soccer and persist through the rain and the calls of their mothers! I like the use of Creole words used throughout as well as a pronunciation guide and information about the Creole language at the end of the book. A good addition to school and classroom libraries to act as both a window and mirror for students! Baptiste Paul's lovely Creole and English story about soccer bringing together a community through good conditions and poor is brought to life with Jacqueline Alcatara's vibrant illustrations. The movement in the illustrations complements the simple yet meaningful prose. Overall, this picture book will be a welcome addition to your library or for all young soccer (futbol) fans. 1/3/2019 ~ A fabulous book to begin the new year! Futbol (aka soccer), Creole & English, friendship, sun & rain, a passion for being together while celebrating a common passion. I thoroughly enjoyed the dual language, perfectly defined in context (though there is a glossary and pronunciation guide at the end) AND the fabulous movement in Alcantara's illustrations. Could this possibly be a Caldecott surprise? This fabulous picture book will definitely find a home in my elementary library. We needed more sports books! Who needs regulation fields or coaches or regularly scheduled games? Just shoo the cows off a pasture, grab some friends and play! Anybody who has lived in poor countries will recognize the great fun from cobbled together games with neighborhood friends, and hopefully it will inspire kids in this country to just go out and play - even better to play out in the rain! Written from the author's own childhood experience of growing up without having electricity, running water or many toys. He did have siblings and friends and futbol (or soccer) was a main attraction. The story is peppered with Creole words and phrases and make the story exciting. 2018 Hornbook Fanfare.